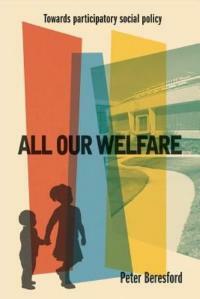 A discussion based on All Our Welfare - Towards participatory social policy by Peter Beresford. Based on a paper prepared by Andrew Roberts for a meeting of the Survivors History Group held Wednesday 29.3.2017. Looking at the book's argument that the theories and practice of welfare service-user involvement offer a blueprint for a new participatory social policy, with special reference to the survivor movement. "There have tended to be a limited range of relationships in public service. There has been the traditional paternalistc/'doing good' model from charity; the public service approach of the post-war welfare state and, more recently, the exchange relationship of the market which has been grafted on to it. But another model has also begun to emerge from service users and their organisations... based on equality, shared experience and understanding." (All Our Welfare page 306). I list below four models that Peter speaks about, (Charity/poor law - Socialist/welfare - Neo-liberal/market - Participatory developed by users) with rough dates for when they were most important. The models could be considered as aspects of Welfare that assume prominence at different times in history. Peter says "starting with and being guided by people's own direct experience of services and support" "distinguishes the user-led approaches" from the others. (All Our Welfare page 302). Peter has argued (2003) that "The greater the distance between direct experience and its interpretation, then the more likely resulting knowledge is to be inaccurate, unreliable and distorted". If we re-write that as a positive statement it could be "direct experience provides more accuracy and reliability to our knowledge". This shows why Peter thinks user experience has contributed so much. For collective organisation, I will start with 26.7.1971 and the "Petition for the Redress of Grievances put forward by the patients in Hartwood Hospital, Shotts Lanarkshire". - The signatories to which were the founding members of SUMP, the Scottish Union of Mental Patients. The Survivors History Group plans to discuss Mark Gallagher's recent account of the emergence of the Scottish Union of Mental Patients on Wednesday 29.11.2017. We will also be looking at how grassroots organisation like this led to national and local Mental Patients Unions from 1973. Laura Mitchison will be leading a walk around historic sites for Hackney MPU on Sunday 7.5.2017. Peter speaks about "user led organisations" as the "natural home for user- controlled services" (see below) and says "such services have developed alongside campaigning". In July 1969 Michael Barnett's radical manisfesto called on "true selves fighting grey goblins", from insde asylums and outside, to join a network of people to "help each other, help others who need help, not by DOING things to them, but by opening themselves to them". The networks formed in London, Leeds, Manchester, Birmingham and elsewhere took the names People Not Psychiatry and People Need People. In September 1973's Spare Rib: "With a Little Help from Ourselves" by Carol Morrell said "Re-evaluation counselling - more often called co-counselling - is perhaps the most radical of the radical therapies: it is peer group therapy. This links together the three terms Peter uses for this thread in user history: Peer support, Co-counselling and Re-evaluation counselling. Peter Cambell has written that, in the autumn of 1985 "the concept of self- advocacy was emerging... the invention of professionals, or at least the professional journals. In the space of eighteen months or so, it had taken over to such an extent that people in user groups - people like myself - began to accept that what we were doing was indeed 'self-advocacy'"
"The Mental Patients Union will represent mental patients wherever they require to be represented. We will fight to make what rights of representation formally exist effective and secure rights of representation wherever they do not exist. We will seek to inform patients and ex-patients about their rights, minimal though they are e.g. the right to appeal against compulsory detention in some circumstances). We will, however, as representatives of our fellow mental patients, refuse to bargain behind the backs of our members with the 'authorities'. We will attempt to provide legal, social and advisory support for all mental patients and ex-patients who ask the Union for help." 1978 On Our Own. Patient-Controlled Alternatives to the Mental Health System, published by Judi Chamberlin in the United States. Judi brought copies to Europe in 1982 to share with survivors here (I still have my copy) and it was republished from London in 1988. Peter begins chapter 14 with a description of the book as making "a compelling case for patient controlled services; a real alternative to the institutions that destroy the confident independence of so many. This is a work of great hope and optimism". I suppose the housing project that the Mental Patients Union ran in Hackney and Wanstead (1974 - 1982) is an example of a "user controlled service" developed by a "user led organisation" "alongside campaigning". The Hackney experience will be explored in the walk organised from Sutton House on Sunday 7.5.2017 as part of the Centerprise history projects. Patient control could be facilitated within the mental health system. In the 1980s, Chesterfield Community Centre included a North Derbyshire Mental Health Services day centre for people becoming reestablished in the community. This was run on increasingly democratic lines and in September 1985 members of the group ran a workshop at a MIND conference called "Handing over control - it helps" The programme said "Members of the North Derbyshire Mental Health Service Project, who took control over their services, will look at what is involved in giving people the power to run their own services, its benefits and its problems". Andrew Hughes recalls an account of a role reversal session. He asked if they had actually given injections to any of the psychiatrists taking part. "With what looked like a very straight face, one of the presenters said, 'Oh no; they would never let us do that'." In 1986 the Chesterfield group were very active in establishing Survivors Speak Out. Ivy Buckland from the centre was the first Survivors Speak Out Treasurer. Ernie Morris, another user, produced the first Survivors Speak Out newsletter. In the 1970s survivors learnt that people would sometimes pay us a fee to talk about our experiences. I have notes on three talks like this I did in 1976. Later, Hackney Workers Education Association enabled groups of patients and ex-patients to run courses on mental health subjects. In 1985, they advertised a nine week course "Your Mind in their Hands". tutored by "Jim Read (Ex-mental patient)" was especially for people who had "ever been a patient in a mental hospital - attended a day centre- had electric shock treatment - taken tranquillisers or anti-depressants - felt you were going mad". Questions like "who decides what 'mental illness' is" were asked and participants learnt "from each other by sharing our own experiences through paired listening, 'going round the group' and discussion." Survivors in Manchester who had become experienced in presentations to students in training and others established their own agency called DATA (Distress Awareness Training Agency) in May 1988. The four members in 1988 were Andrew Hughes, Anne Plumb, Tony Riley and Helen Gibb. The relation between survivors and those who hold power and money in society was changing. Whereas SUMP organised as part of the social underground in Hartwood Hospital, and Hackney MPU ran three houses without any funding, DATA secured two grants from a fund launched in 1987 by the National Council for Voluntary Organisations for "projects led and controlled by disabled people and related to training or employment". The second grant, with extra financial help from Rochdale Council, was used to organise a "Training the Trainers" two day event in May 1993. "In 1988, my local service-user group, "Camden Mental Health Consortium" joined forces with ... "Good Practices in Mental Health ... to conduct one of the first pieces of user-led research in mental health. We interviewed people who had experience of acute wards both in the old asylum and in the new community hospital provision, to find out how they compared. Most of us, including me, had experience of both settings. So began my new identity as user-researcher." Diana continues: "At the same time, work was being done in Bristol, and 10 years later there were two thriving programmes of user led research in London NGOs". She references Faulkner, A and Layzell, S (2000) Strategies for Living: A report of user-led research into people's strategies for living with mental distress. London: Mental Health Foundation and Rose, D (2001) Users' Voices: The perspectives of mental health service users on community and hospital care. London: Sainsbury Centre for Mental Health. April 1996 saw the first meeting of the "Standing Advisory Group on Consumer Involvement in the NHS Research and Development Programme" established by the Director of Research and Development in the Department of Health. Later known as "Consumers in NHS Research". In 2001 the Group widened its remit to cover public health and social care research commissioned by the Policy Research Programme of the Department of Health. It became INVOLVE in July 2003. 2003 Peter Beresford's "It's Our Lives: A short theory of knowledge, distance and experience" argues that experience gives a special dimension to the authenticity of knowledge. "User involvement in professional education and learning progressed from being an add-on offered by service users, to an integrated and essential part of qualifying services". From 2003 User and carer involvement was required in all aspects of social care (Social Work) education. (All Our Welfare page 304). This was set out by the Minister of State in the booklet Requirements for Social Work Training. Department of Health June 2002 and came into force with the new Social Care degrees in 2003. The work of users and others at Birmingham University would be a good area to study with respect to how user activity contributed to this institutionalisation. In Celebrating 100 Years of Social Work (2008), Ann Davis wrote "At Birmingham established partnerships with service users and carers and their organisations have grown to make this requirement a reality. New students meet service users and carers alongside academic staff and practitioners at admission interviews, fitness for practice panels and in the classroom. These colleagues in social work education are enriching student's learning experience and adding through publications and papers to the knowledge base of social work.". 8.7.2016 Searching for a Rose Garden: challenging psychiatry, fostering Mad Studies - a collection of articles edited by Jasna Russo and Angela Sweeney published. Jasna was the main organiser of the international conference "Searching for a Rose Garden. Fostering Real Alternatives to Psychiatry" in 2011 and the main focus of the book, coming from the international conference, is on "alternatives", following in the tradition of Judi Chamberlin's Patient-Controlled Alternatives to the Mental Health System. See summary of Survivor History Group meeting on Wednesday 26.7.2017 which discusses what a rose garden is. The book contains international examples of alternatives. As the book's subtitle indicates, a new phrase, "Mad Studies", has entered the vocabulary of survivor history. What is it and what is its relevance? PROMPT, the Preservation of the Rights of Patients in Therapy was the user led organisation that focused on campaigning in the 1970s, starting with its campaign against ECT and brain surgery. In his lecture, Peter Bersford discusses campaigning for a "participatory model". He says: "In my book All Our Welfare, I looked at both what more participatory social policy might look like" [his "vision for future participatory welfare"] and ... how we might get it; that is to say participatory ways of achieving such change". Their own ways of implementing policy and practice. ... Service user movements offer a model for renewing the welfare state; building from the bottom up, providing the infrastructure for us to get engaged in the process, through supporting small community organisations - the real meaning of a bigger society." As well as offering "a vision for future participatory welfare", survivor organisations offer "a force for change to achieve it, building popular support." "Significantly we have seen such grassroots service user organisations take the lead in successfully challenging current welfare reform, with others - from big charities to the House of Lords - following their lead, rather than vice versa." In mid July 2010 a notice was circulated saying that the "surviving members of the classic Mad-Pride line-up" (Simon Barnett, Robert Dellar, Debbie McNamara and Mark Roberts) welcome all "mental health survivors" to a "public meeting to discuss and plan direct action to oppose and condemn government's attack on welfare benefits for those labelled mentally ill or otherwise disabled" at Pogo Cafe, 76 Clarence Road, Hackney, on Saturday 24.7.2010. This led to the Mental Health Resistance Network. The Survivor History Group's files are really deficient on the history of recent welfare struggles. Can anyone help?